To celebrate the printing of la booklette, I have knitted Henry the Bear in my favorite color combination - pink, pinker, and yellow-green. I have named her Jolene; yes, I listen to a lot of country music. You can buy the booklet here. Only $8, $1 per pattern. Wow! Plus postage. If you have any problems ordering, please email me at jessieredrose@yahoo.com. I will typically send out the booklets the day after they are ordered. Please let me know what you think of the fruit of my labors, and if you make any of the dudes, please send me photos! This post is starting to sound like it was written by Fred Milton, Lynda Barry's awesome beatnik poodle. Wow! How deeply #1! Love your Blog - Bought the book!!! can't wait to get mine. eeeeeeeeeee! How exciting! I can't wait to get my copy! I'm very excited!! time to go yarn shopping. I got mine! Yippee! I guess I gotta learn how to knit now! Snowbear, you got yours already? How so soon??? Congratulations! I can't wait to get mine! Yay! I'm so excited to get my booklet. Congrats! What a great idea to put out a self-published booklet! And they look SO cute! Just bought the book, I'm so excited! Thanks so much for putting out your book! Really beautiful and adorable! Congratulations on your book! It seems to be doing very well already! I look forward to seeing the earth populated by the knitted creatures you designed!! I got my book last week and I think it looks amazing. And I couldn't believe how fast it came! Thank you so much for putting out a book!! Now I just have to learn how to knit. 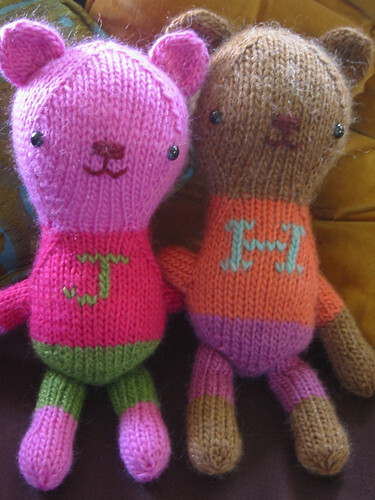 I love your blog and absolutely LOVE your knitted toys!! I'm dying to buy your booklet so please please get some more in soon!! !